As our airplane circled Mount Etna and descended into the airport at Catania, groves of dark green citrus trees came into view. We were landing in Sicily, an island that we would call home for two months. We had left four feet of snow and sweet Rosie, our golden retriever, in Virginia with our son Noah and his family. I was looking forward to learning new ways of cooking familiar and unfamiliar food. I had traveled to Europe but never lived there. Living in Sicily meant that we would not be tourists. 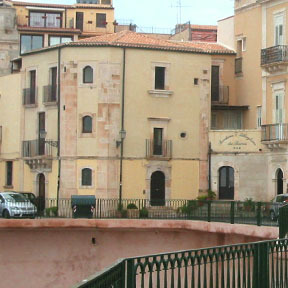 We had rented a flat in Ortigia, a small island attached by a bridge to the city of Siracusa and surrounded by a sea wall built in the fourth century BC by the Greeks. We spend part of each day getting lost. It wasn’t difficult, the narrow lanes, many impassable except on foot or scooter, twist and turn. 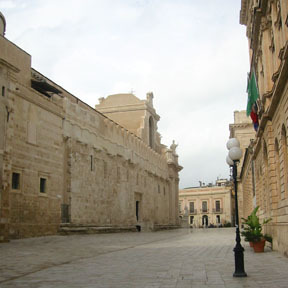 There are ancient ruins, medieval, art noveau, art deco, and Mussolini era buildings. Each time I thought I was hopelessly lost, one of two things happened. Either I saw the sea or turned onto the via Roma. Since our apartment faced the sea and we were on an island, I knew I would get home eventually if I didn’t cross a bridge. If I found via Roma, I knew that it led to the Piazza Duomo, a sacred space with a cathedral that was originally a Greek Temple, and also the location of the best gelato shop in Ortigia. The ruins of the Greek temple to Apollo, near the Archimedes Fountain and the market, were where Charles and I met so that we could go to the market together after he had spent the morning writing at the library. Along with heaps of lemons, blood oranges, and mandarins, there tomatoes and peppers that are grown in Sicilian versions of hoop houses, olives of all sorts, and local wines in recycled, two liter plastic bottles. 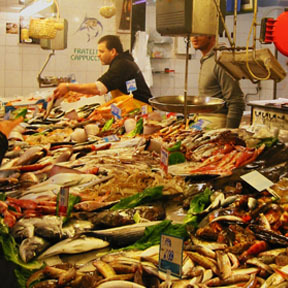 There was also a wide variety of fish and seafood from the Ionian Sea. 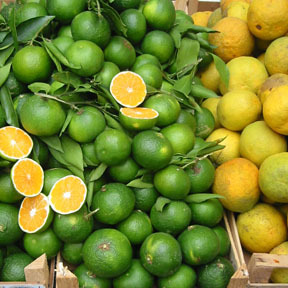 I went to the market every day and just as my first friends in Vermont were the vendors at the Norwich Farmers’ Market, my first friend is Sicily were the vendors at the Ortigia market. . Click here to see the vendors at the Ortigia market. I met Angelo Cappucho who like his father and grandfather before him sold all kinds of fish including swordfish, tuna, cuttlefish, squid, eels, and shrimp. When a genuine troubadour appeared in the market, all of the men at Cappucho’s joined in singing Sicilian folk songs with him. For a glorious hour, we were part of a Sicilian opera. Angelo and his son Marco insisted that all of the nearby vendors put food into a large bag as payment for the music. 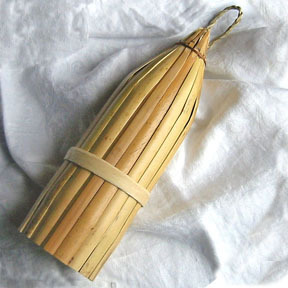 A traditional Sicilian ricotta basket. Click here to read about making cheese with Andrea. It was Andrea Borderi who stole my heart. Andrea made fresh ricotta and mozzarella each morning. The cheese was the best I’ve ever tasted, but even more astounding than the cheese was his generosity. He fed people. Andrea’s knife had a twenty-inch blade that was in constant motion. He cut cheese and offered samples on the tip of his knife to passers by. He made sandwiches and insisted that shoppers sample them. He fed cannoli to giggling students and serious Nonna’s. He never stopped smiling, and his blue eyes matched his blue satin necktie. Our lives were quite simple in Ortigia. We had a small apartment, a tiny kitchen and no car. We watched the sea, had small dinner parties, ate gelato every afternoon after a walk around the island, read and wrote each day. The day before we left, I went to the market and said goodbye to Giuseppe who sold the best olives, Mario with the small plum tomatoes I liked best for pasta, Joseph who offered grilled peppers and artichokes, Francesco who sold traditional chocolate from Modica and of course the musical Cappucho fishermen. It wasn’t easy, but I managed until I saw Andrea. He smiled and offered me a piece of cheese. I began to cry. He put down his knife, kissed my hand, and I wept as we said arriverderci.